WebUpd8 reader Reda El Khattabi has created a small tool that makes it very easy to create an Ubuntu AppIndicator for Zenity, YAD (a Zenity fork with many improvements) or basically any bash script or command. For now the tool doesn't support specifying a timeout after which it should quit, but this feature might be added in the future. "-p" makes the indicator persistent and adds a quit menu item at the end - without it, the indicator quits after executing the select action. 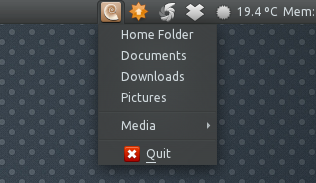 "-i" specifies an icon from the current icon theme (don't use an exact path to an icon, it won't work. Just enter an icon name). Thanks to Réda for the tip!